System which creates and maintains good conditions of comfort and visibility in the vehicle's passenger compartment. The incoming air follows various routes depending on the controls selected by the driver, the front passenger and rear passengers, according to the level of equipment. The temperature control enables you to obtain the level of comfort required by mixing the air of the various circuits. The air distribution control enables you to select the air vents used in the passenger compartment by the combined use of the associated buttons. The air flow control enables you to increase or reduce the speed of the ventilation fan. These controls are grouped together on control panel A on the centre console. 6. Adjustable air vents for the rear passengers. 7. Air outlets to the rear footwells. In order for these systems to be fully effective, follow the operation and maintenance guidelines below: If the interior temperature remains very high after the vehicle has been parked in the sun for a considerable time, first ventilate the passenger compartment for a few minutes. 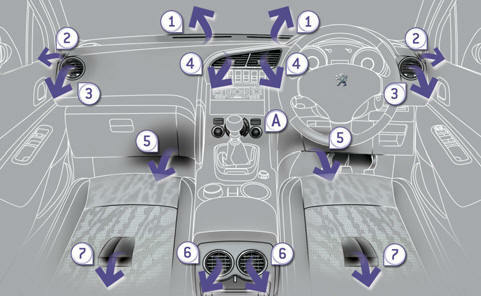 Place the air flow control at a sufficient level to provide an adequate renewal of air in the passenger compartment. Use in preference the intake of exterior air as prolonged use of the air recirculation may cause misting of the windows and side windows. Do not cover the sunshine sensor, located on the dashboard; this is used for regulation of the automatic air conditioning system. Operate the air conditioning system for 5 to 10 minutes, once or twice a month to keep it in good working order. Ensure that the passenger compartment filter is in good condition and have the filter elements replaced regularly (refer to the "Checks" section). We recommend the use of a combined passenger compartment filter. Thanks to its second special active filter, it contributes to the purification of the air breathed by the occupants and the cleanliness of the passenger compartment (reduction of allergic symptoms, bad odours and greasy deposits). The air conditioning uses power from the engine while operating. This results in an increase in the vehicle's fuel consumption. When towing at or near maximum capacity or on steep slopes in high ambient temperatures, switching off the air conditioning saves engine power and so improves towing capacity. Condensation created by the air conditioning results in a discharge of water under the vehicle when stationary, which is perfectly normal. To ensure correct operation of the air conditioning system, you are also advised to have it checked regularly. If the system does not produce cold air, do not use it and contact a PEUGEOT dealer or a qualified workshop.